Everything Counts! is an execution strategy for inspiring excellence and driving exceptional results. Too many people and organizations are mired in a mediocrity of their own making. They focus their attention and efforts on getting the big things right, but they ignore the little things that often make a big difference. As a result, reputations are damaged, brands diluted, and loyalty is lost by blatant disregard for the small stuff which negatively impacts the customer experience. For years, we've been taught not to sweat the small stuff, but in the real world of business, Everything Counts. 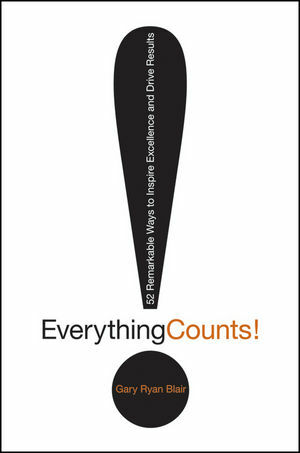 Everything Counts is a call to greater awareness and with awareness comes a responsibility to raise the performance bar. It offers a powerful operating philosophy that will steer your organization to reach higher levels of growth, productivity, and performance. From the smallest customer contact to the most minute details of product quality, the little things add up to a pretty big deal. Serving as the definitive guide on organizational and personal mastery, this book gives you a foundation for unparalleled customer service, superior quality, and consistent performance. Everything Counts reminds us that seemingly small things can make tremendous differences. The purpose of this book is to help you internally define and take ownership of the most fundamental principle behind achieving results beyond you expectations-a single idea with an actionable focus-Everything Counts! Gary Ryan Blair is the President of The GoalsGuy, a highly focused training organization that helps clients build and sustain superior performance. His coaching services, training programs, and handbooks have been used by thousands of organizations and more than four million employees worldwide. 14 Rewards and Recognition Count. Top Ten Reasons to Visit EverythingCounts.com.